Migration to IP is a well-known term and almost every broadcaster has already started thinking about – or even acting on – how to upgrade core infrastructure. The migration to IP brings a lot of benefits. In terms of live broadcasting events, many of these benefits result in lowering the end cost. The overall live event streaming workflow requires the video and audio signals to go through multiple formats and devices between the camera to the consumer’s television, tablet or phone. The requirement for a very low end-to-end video latency together, with a high-quality image specification, creates a technical challenge. High-quality broadcast signal(s) must be transferred to the multiple distributors. They will transcode this high-quality signal into the lower bitrate codecs and resolutions suitable for devices used by their customers. In situations where the broadcast and online providers own the whole infrastructure, or co-operate on the technical requirements and agree on the playout formats, it would be ideal to produce the lower-bitrate distribution formats right at the contribution studio side. The final playout video streams and formats are directly sent to the distribution networks (TV over the air, IPTV, on-demand broadband with CDN and others). This was almost impossible when video & audio came through SDI infrastructure because it required too many point-to-point connections, encoding, decoding and it was impractical and expensive to send so many low-bitrate streams from the contribution node to the distribution venues. With that small revolution in video transition to IP networks, multiple signals can be shared via the same wire (like TR-01 with JPEG2000, for example). The problem of too many physical connections between or within content providers, playout and distributors are solved. 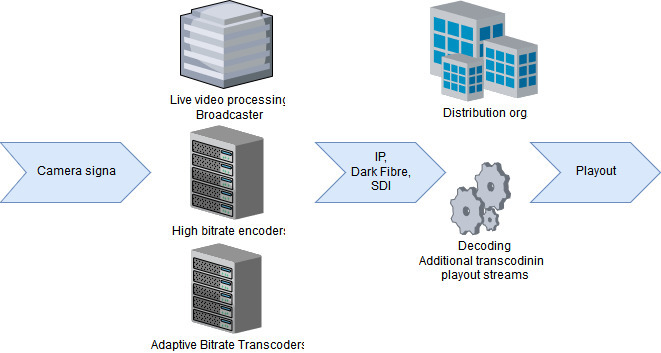 What is adaptive bitrate video transcoding? Further, with all content handled as IP files or streams, it becomes practical to transcode to multiple formats. In particular, it allows for adaptive bitrate (ABR) streaming, which ensures the best possible reception at the consumer device by sending multiple resolutions in parallel. There are two practical options how to do video transcoding for multi-platform distribution. First, send high-quality video streams over IP or dark fiber to the distributor who owns transcoders to take each stream and convert the input video to the required outputs. The downside is a need for encoders and encapsulators for uncompressed or high-bitrate JPEG2000 output on one side, and multiple H.264, H.265, MPEG-2 and more hardware encoders on the other side. The hardware encoders must be installed and maintained at every distribution location, which increases the number of people responsible for the live streaming. Also, it requires high bandwidth connectivity, probably using dark fiber, connectivity for the very high quality uncompressed or JPEG2000 content distribution. Comprimato proposes a second option, which processes the video and audio streams at the point of origination. Here the broadcaster or content owner creates all the playout streams, using the various required codecs. Final processing of each signal – such as logo insertion – can be carried out inside each stream at the point of delivery. The advantage of this solution is that you eliminate the need for JPEG2000 or uncompressed video to low-bitrate codec transcoders at each receiving point. Instead, you centralize control of the live video streams, giving technical and quality management for virtually the entire workflow to one team. It is also an ideal solution when there is no high-speed fiber connectivity between the broadcaster or content owner and the delivery locations. The challenge here is to have a transcoder which can handle multiple input high-quality streams and produce dozens of ABR outputs real time. The technical challenge for such a solution lies in creating high-performance software which combines encoding and ABR transcoding in one software instance. The Comprimato Live transcoder meets this challenge. Its ability to work with inputs including TR-01 and uncompressed video over SMPTE standards and deliver multiple H.264, H.265, MPEG-2 or VP9 outputs. Comprimato uses unique algorithms for GPU and CPU acceleration and offers extremely high stream density transcoding with more than 70 Full HD streams at 60 fps. This simplifies the final workflow setup with fewer devices to configure and maintain. It is also a cost-effective solution, particularly as it eliminates the need for expensive broadcast-quality transcoding for distribution. Does lowering latency mean low video quality? Nobody likes to hear “goal” roar two from the outside two seconds before his TV. For live events like a football match, Formula 1 or important news, consumers expect to get a picture to a television or tablet with minimal delay (latency). Consumers are used to the instantaneous nature of traditional broadcasting, where radio and television were in sync and contributed effectively no delay. While there is inevitably some latency in online services case, anything higher than a two-second image delay becomes noticeable, cumbersome to work with, and generally unacceptable. In some cases, like remote video referees, the video has needs to be quickly replayed and reviewed. Low latency is critical. Unfortunately, lowering the latency usually lowers the resultant image quality. The goal must be to maintain high image quality with latency under 800ms for the conversion from the broadcast signal to the multiple lower bitrate outputs. The new Comprimato Live transcoder guarantees end-to-end image latency under 500ms. This very low latency it not at the expense of the delivery image quality, making it an ideal replacement for existing “encoder-transcoder” setups, which usually produce higher latency or degraded image quality. Comprimato uses various codec encoders and engines, so it adaptively selects the best encoding on the desired output resolution, bitrate, bit-depth and other parameters. 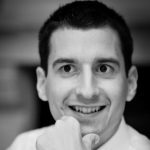 How can software video transcoding lower streaming cost? The commercial success of a new service depends upon consumer acceptance, and the ability to be able to deliver the service at a commercial cost. That is very much the case for multi-platform delivery. Content creators, service providers, and broadcasters started to move to a mind set where it may be better to lease the infrastructure or transcoding service, rather than own the entire IT infrastructure, knowing that it will need continuing maintenance and upgrades as technology evolves. Migration to IP will help broadcasters manage and store most of their assets in local studios, and minimize the number of people and devices at the remote locations. One of the big opportunities to reduce the overall cost of live event streaming is to prepare the distribution multi-screen video right at the point of final creation. With the new generation of purely software-based transcoders like Comprimato Live Transcoder and subscription licensing model, this becomes a practicality. Transcoders based on dedicated hardware require a big initial investment, usually in tens and maybe hundreds of thousands of dollars as a capital expenditure. The result is a high cost per stream, and when added to low flexibility for ad-hoc additional streaming capacity, the need for a better solution is clear. The Comprimato solution is a software-defined, high-performance transcoder which can run on any standard x64 server architecture with NVIDIA’s GPUs or as a virtualized device on VMWare. This reduces the cost to the hundreds of dollars per stream level. Because it is virtualized software, it can be instantly deployed on other servers to increase stream capacity for ad hoc requirements. With frequent software updates and subscription licensing models it minimizes capital investment and continuously offers updates to new functionality like 4k or HDR. Because it is virtualized software, it can be instantly deployed on other servers to increase stream capacity for ad hoc requirements. With frequent software updates, it continuously offers updates to new functionality like 4k or HDR. The Comprimato Live transcoder is now ready for free trial download and installation. It takes you less than 30 minutes to install a test stream input to output transcoding over IP. A complete technical specification is listed in the Comprimato data sheet document.